First of all, know that this is complex question which can’t be accurately estimated via an article, so this piece is just giving you a ballpark so you can have an intelligent conversation with a Coach. Ok with that said, a place you can start is by determining how many calories you already burn in a day. If you eat the exact number of calories you need each day, you will maintain your current weight. If you eat less than what you need, you will lose weight. And if you eat more calories than you need, you will gain weight / muscle. It’s not as simple as calories in = calories out, but this is a good starting point. *note: 1 inch = 2.54 cm and 1 kilogram = 2.2 lbs. Slightly Active – 1.375 – Exercise or Light Sports 1 to 3 Days a Week, Light Jogging or Walking 3 to 4 Days a Week. Choose this if your workouts are kinda light for now so that you don’t break out into a sweat. Lightly Active – 1.425 – Exercise or Moderate Sports 2 to 3 Days a Week, Light Jogging or Walking 5 to 7 Days a Week. Choose this if you are working out a few days or more each week and breaking a light sweat. Moderately Active – 1.55 – Physical Work, Exercise, or Sports 4 to 5 Days a Week, Construction Laborer. Choose this if you are working out multiple days a week and breaking into a full sweat. Very Active – 1.75 – Heavy Physical Work, Exercise, or Sports 6 to 7 Days a Week, Hard Laborer. Choose this if you are working out a little more frequently than above and breaking into a full sweat, but also work a physically demanding job. 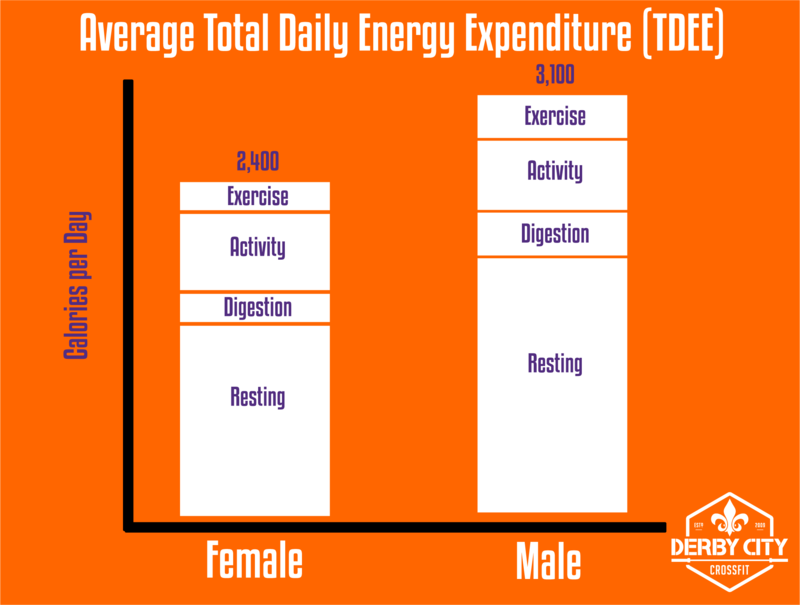 After picking a category, you’d calculate the total amount of calories you need each day by multiplying your BMR and your activity factor to get your total daily energy expenditure (TDEE). This is the amount you would need to eat every day to maintain your current weight. Again, if you maintain this physical activity level inside- and outside-the-gym, and if you eat less than this TDEE number, then you should lose weight. Eat more, you should gain weight / muscle. There’s a starting point for you to figure out how much to eat and how much you’re burning. I’ll follow-up with another article about portion sizes so you can figure out how to meet these numbers. Again, this is just informational and you’ll need to personally fine-tune these formulas to make them most effective for you. We just want you to start thinking about how much energy you’re really expending. If you’d like more assistance, contact us about personalized Nutrition Coaching.